At the beginning of the twentieth century, European immigration reached unprecedented peaks. African Americans from the South poured into Harlem, while eastern and southern Europeans settled in the Lower East Side of Manhattan. In this lesson, students compare and contrast two early twentieth-century processions. 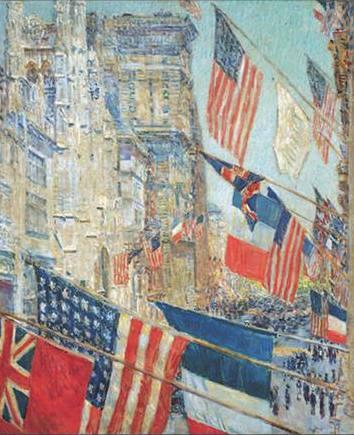 American Impressionist Childe Hassam painted America’s patriotic exuberance on Allies Day soon after the country entered World War I. Jerome Myers, an American Realist, often associated with New York’s Ashcan School artists, painted an Italian immigrant procession. Students read Russian immigrant Elias Lieberman’s patriotic poem “I Am an American” before writing an imagined immigrant’s feelings in an “I Am” poem. + Compare Childe Hassam’s and Jerome Myers’s paintings of early twentieth-century street scenes. + Write an “I Am” poem that shows an understanding of immigrant life in large American cities in the early twentieth century. Students will analyze Childe Hassam’s painting Allies Day, May, 1917, 1917, through three short exercises. After students have studied the painting for a few minutes, suggest that they write a few words or phrases that come to mind as they look at it. Let students share their words with the rest of the class. Have students watch a short video about Hassam’s Allies Day, :"Allies Day," May 1917, 1917, Childe Hassam or http://www.thirteen.org/picturing-america/childe-hassam-allies-day/#.Uh9o4xZu_A Have students describe the mood of this painting. Ask them how Hassam created this mood. He created an exuberant, cheerful, patriotic mood or spirit with light, bright colors and the American flag colors, red, white, and blue. Students compare Childe Hassam’s Allies Day to Jerome Myers’s painting Italian Procession, using a Venn diagram Worksheet. Show students Jerome Myers’s Italian Procession. Place it or project it next to Childe Hassam’s Allies Day. Ask students what seems to be happening in this painting. Encourage them to look for symbols. People in this crowd are carrying religious banners, holding candles, and an American flag’s stripes are near the lower left. A small cross tops a shape that might be a reliquary or enclosure for a religious statue. Garland swags, rosettes, and lights decorate the building. Although both Hassam’s and Myers’s street scenes take place on New York City’s Manhattan island, the Allies Day parade is in a wealthy part of town, while the Italian procession is in the Lower East Side—a slum crowded with recent southern and eastern European immigrants. Provide each student with a copy of Elias Lieberman’s poem “I Am an American,” and follow-up discussion questions worksheet. After students read the poem and consider the thought questions, discuss their responses to this poem. In this lesson, you will design a banner that shows your ethnic heritage. Use these questions and activities to get started. 1. What countries did your great-grandparents (or even farther back) come from? 2. What does that country’s flag look like? You might have more than one country in your background. 3. What festivals did your ancestors celebrate in their country of origin? 4. What traditions and objects are associated with this? 5. Which of these festivals does your family still celebrate? Research symbols associated with this festival or your ancestor’s original country or countries. This may be as simple as flag colors. You might try combining symbols from the old culture(s) with those of their new homeland. Design a banner or flag that could be carried in a procession or displayed at a festival.Draw a series of quick, small thumbnail sketches of possible designs for your banner. Have students write an imaginary jounal entry for a day in the life of the late nineteenth- or early twentieth-century child laborer. They should include information about the job he did, the dangers of the job, and the reasons he had to work. This information should be based on what the students have learned from the previous activities. Display these diary entries with a drawing or photograph of their subject. 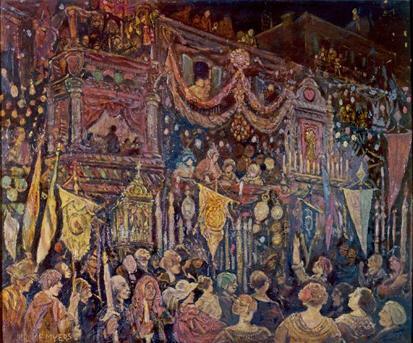 Have students analyze Italian Procession by looking for all the candles in the artwork. Show students the three-dimensional image of a candle mold from the Newark Museum’s teaching collection. Ask students by looking at the object, how were candles made? What was the process for making them? How does the candle light contribute or change the artwork. Immigration continues to be a hot topic in Congress and in the news. Start a bulletin board or webspace where students can post immigration news. Jerome Myers was an urban Realist who often sketched and painted idealized scenes of Lower East Side immigrants. His subjects included religious processions, children playing, and marketplaces. His visions of happy, clean, everyday life in New York’s slums were far from the harsh reality shown in contemporary photographs. Myers was considered a Progressive because he chose to paint these impoverished subjects.He is often associated with the Ashcan School, an early twentieth-century group of American artists who painted common street scenes and the underside of city life. But Myers began painting his urban vision more than a decade before Ashcan artists influenced American art. His muted color compositions of soft forms were an optimistic view of city life. Allies Day, May 1917, 1917. 36 ½ x 30 ¼ in. (92.7 x 76.8 cm.). Gift of Ethelyn McKinney in memory of her brother, Glenn Ford McKinney. Frederick Childe Hassam was born in Massachusetts in 1859. At seventeen, he was apprenticed to a wood engraver, but soon became a freelance illustrator. He studied art in Boston before traveling to Paris, where he studied art and exhibited in the Paris salons. Hassam painted a series of variations of Allies Day, May 1917. The United States had entered World War I along with her allies, France and Britain. Flags of all three nations, along with a Canadian flag, line the street as a huge parade fills the Manhattan street below. Hassam painted this scene from a balcony at Fifth Avenue and Fifty-second Street. He dedicated this painting "to the coming together of [our] three peoples in the fight for democracy."